This document specifies a STREAMS -based kernel-level instantiation of the ISO/CCITT network service definition. The Network Provider Interface (NPI) enables the user of a network layer service to access and use any of a variety of conforming network layer service providers without specific knowledge of the provider's protocol. The service interface is designed to support any connection-mode network protocol and connectionless network protocol. This interface only specifies access to network layer service providers, and does not address issues concerning network layer management,protocol performance, and performance analysis tools. The specification assumes that the reader is familiar with the OSI reference model terminology, ISO/CCITT Network Layer Service, and STREAMS . This document specifies an interface that supports the service provided by the Network Services Definition for Open Systems Interconnection for CCITT Applications as described in CCITT Recommendation X.213 (see X.213) and ISO 8348 (for CONS) (see ISO8348) and ISO8348/Addendum 1 (for CLNS) (see ISO8348/AD1). These specifications are targeted for use by) and ISO 8348 (for CONS) (see ISO8348) and ISO8348/Addendum 1 (for CLNS) (see ISO8348/AD1). These specifications are targeted for use by developers and testers of protocol modules that require network layer service. An NS user that initiates a Network Connection (NC). An NS user with whom a calling NS user wishes to establish a network connection (NC). Kernel level protocol or user level application that is accessing the services of the network layer. Network layer entity/entities that provide/s the services of the network interface. The Network Layer provides the means to manage the operation of the network. It is responsible for the routing and management of data exchange between network-user entities. The NPI defines the services provided by the network layer to the network-user at the boundary between the network layer and the network layer user entity. The interface consists of a set of primitives defined as STREAMS messages that provide access to the network layer services, and are transferred between the NS user entity and the NS provider. These primitives are of two types; ones that originate from the NS user, and others that originate from the NS provider. The primitives that originate from the NS user make requests to the NS provider, or respond to an event of the NS provider. The primitives that originate from the NS provider are either confirmations of a request or are indications to the NS user that the event has occurred. Figure 1 shows the model of the NPI. The NPI allows the NS provider to be configured with any network layer user (such as the OSI Transport Layer) that also conforms to the NPI. A network layer user can also be a user program that conforms to the NPI and accesses the NS provider via putmsg(2s) and getmsg(2s) system calls. The features of the NPI are defined in terms of the services provided by the NS provider,and the individual primitives that may flow between the NS user and the NS provider. The services supported by the NPI are based on two distinct modes of communication, connection (CONS) and connectionless (CLNS). In addition, the NPI supports services for local management. It provides reliable data transfer. There are three phases to each instance of communication: Connection Establishment; Data Transfer; and Connection Termination. Units of data arrive at their destination in the same order as they departed their source and the data is protected against duplication or loss of data units within some specified quality of service. Connectionless mode communication has no separate phases. Each unit of data is transmitted from source to destination independently, appropriate addressing information is included with each unit of data. As the units of data are transmitted independently from source to destination, there are, in general, no guarantees of proper sequence and completeness of the data stream. The NPI specifications also define a set of local management functions that apply to both CONS and CLNS modes of communication. These services have local significance only. Table 1 and Table 2 summarizes the NPI service primitives by their state and service. This section describes the services of the NPI primitives. Time-sequence diagrams that illustrate the sequence of primitives are included. (Conventions for the time-sequence diagrams are defined in CCITT X.210 (see X.210).) The format of the primitives will be defined later in this document. The services defined in this section are outside the scope of the international standards. These services apply to both connection-mode as well as the connection-less modes of communication. They are invoked for the initialization/de-initialization of a stream connected to the NS provider. They are also used to manage options supported by the NS provider and to report information on the supported parameter values. This service provides information on the options supported by the NS provider. N_INFO_REQ: This primitive requests that the NS provider return the values of all the supported protocol parameters. This request may be invoked during any phase. N_INFO_ACK: This primitive is in response to the N_INFO_REQ primitive and returns the values of the supported protocol parameters to the NS user. The sequence of primitives for network information management is shown in Figure 2. This service allows a network address to be associated with a stream. It allows the NS user to negotiate the number of connect indications that can remain unacknowledged for that NS user (a connect indication is considered unacknowledged while it is awaiting a corresponding connect response or disconnect request from the NS user). This service also defines a mechanism that allows a stream (bound to a network address of the NS user) to be reserved to handle incoming calls only. This stream is referred to as the listener stream. N_BIND_REQ: This primitive requests that the NS user be bound to a particular network address, and negotiate the number of allowable outstanding connect indications for that address. N_BIND_ACK: This primitive is in response to the N_BIND_REQ primitive and indicates to the user that the specified NS user has been bound to a network address. The sequence of primitives for NS user bind service is shown in Figure 3. This service allows the NS user to be unbound from a network address. N_UNBIND_REQ: This primitive requests that the NS user be unbound from the network address that it had previously been bound to. The sequence of primitives for NS user unbind service is shown in Figure 4. N_OK_ACK: This primitive indicates to the NS user that the previous NS user originated primitive was received successfully by the NS provider. An example showing the sequence of primitives for successful receipt acknowledgement is depicted in Figure 4. This service allows the NS user to manage the QOS parameter values associated with the NS provider. N_OPTMGMT_REQ: This primitive allows the NS user to select default values for QOS parameters within the range supported by the NS provider, and to indicate the default selection of receipt confirmation. Figure 5 shows the sequence of primitives for network options management. N_ERROR_ACK: This primitive indicates to the NS user that a non-fatal error has occurred in the last NS user originated request or response primitive (listed in Figure 6), on the stream. 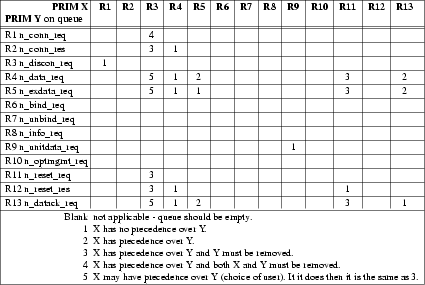 Figure 6 shows the sequence of primitives for the error management primitive. This section describes the required network service primitives that define the CONS interface. The queue model for CONS is discussed in more detail in CCITT X.213 (see X.213) section 9.2. The queue model represents the operation of a network connection in the abstract by a pair of queues linking the two network addresses. There is one queue for each direction of information flow. Each queue represents a flow control function in one direction of transfer. The ability of a user to add objects to a queue will be determined by the behaviour of the user removing objects from that queue, and the state of the queue. The pair of queues is considered to be available for each potential NC. Objects that are entered or removed from the queue are either as a result of interactions at the two network addresses, or as the result of NS provider initiatives. A queue is empty until a connect object has been entered and can be returned to this state, with loss of its contents, by the NS provider. Objects may also be entered into a queue by the NS provider. Objects are removed from the queue under the control of the receiving NS user. if the following object is defined to be destructive with respect to the preceding object on the queue. If necessary, the last object on the queue will be deleted to allow a destructive object to be entered - they will therefore always be added to the queue. For example, “disconnect” objects are defined to be destructive with respect to all other objects. “Reset” objects are defined to be destructive with respect to all other objects except “connect”, “disconnect”, and other “reset” objects. Table 3 shows the ordering relationships among the queue model objects. A pair of queues is associated with an NC between two network addresses when the NS provider receives an N_CONN_REQ primitive at one of the network addresses resulting in a connect object being entered into the queue. The queues will remain associated with the NC until a N_DISCON_REQ primitive (resulting in a disconnect object) is either entered or removed from a queue. Similarly, in the queue from the called NS user, objects can be entered into the queue only after the connect object associated with the N_CONN_RES has been entered into the queue. Alternatively, the called NS user can enter a disconnect object into the queue instead of the connect object to terminate the NC. The NC establishment procedure will fail if the NS provider is unable to establish an NC,or if the destination NS user is unable to accept the N_CONN_IND (see NC Release primitive definition). N_CONN_REQ: This primitive requests that the NS provider make a connection to the specified destination. N_CONN_RES: This primitive requests that the NS provider accept a previous connection indication. N_CONN_IND: This primitive indicates to the NS user that a connect request has been made by a user at the specified source address. N_CONN_CON: This primitive indicates to the NS user that a connect request has been confirmed on the specified responding address. The sequence of primitives in a successful NC establishment is defined by the time sequence diagram as shown in Figure 7. The sequence of primitives for the NC response token value determination is shown in Figure 8 (procedures for NC response token value determination are discussed in sections 4.1.3 and 4.1.4.). Flow control on the NC is done by management of the queue capacity, and by allowing objects of certain types to be inserted to the queues, as shown in Table 4. N_DATA_REQ: This primitive requests that the NS provider transfer the specified data. N_DATACK_REQ: This primitive requests that the NS provider acknowledge the data that had previously been received with receipt confirmation requested. N_EXDATA_REQ: This primitive requests that the NS provider transfer the specified expedited network service data unit. N_DATA_IND: This primitive indicates to the NS user that this message contains data. N_DATACK_IND: This primitive indicates to the NS user that the remote NS user has acknowledged the data that had previously been sent with receipt confirmation requested. N_EXDATA_IND: This primitive indicates to the NS user that this message unit contains expedited data. Figure 9 shows the sequence of primitives for successful normal data transfer. The sequence of primitives may remain incomplete if a N_RESET or N_DISCON primitive occurs. The sequence of primitives in a successful confirmation of receipt is defined in the time sequence diagram as shown in Figure 10. The sequence of primitives as shown above may remain incomplete if an N_RESET or an N_DISCON primitive occurs (see Table 3). A NS user must not issue an N_DATACK_REQ primitive if no N_DATA_IND with confirmation request set has been received, or if all such N_DATA_IND have been previously acknowledged. Following a reset procedure (N_RESET_REQ or N_RESET_IND), a NS user may not issue aN_DATACK_REQ to acknowledge an outstanding N_DATA_IND received before the reset procedure was signalled. Note—The withholding of confirmation of receipt by a NS user can have an effect on the attainable throughput on the NC. The sequence of primitives for expedited data transfer is shown in the time sequence diagram in Figure 11. This sequence of primitives may remain incomplete if a N_RESET or N_DISCON primitive is issued. The reset service is used by the NS user to resynchronize the use of the NC, or by the NS provider to report detected loss of unrecoverable data. a N_RESET_IND from the NS provider, followed by a N_RESET_RES from the NS user. 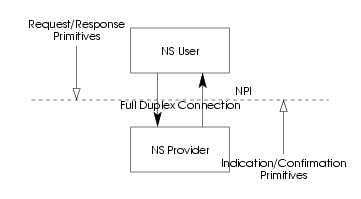 invoked by one NS user and the NS provider, leading to interaction (A) with the originating NS user and (B) with the peer NS user. All N_DATA, N_EXDATA, and N_DATACK primitives issued before issuing the N_RESET_REQ/N_RESET_RES that have not been delivered to the other NS user before the N_RESET_IND/N_RESET_CON are issued by the NS provider,should be discarded by the NS provider. Any N_DATA, N_EXDATA, and N_DATACK primitives issued after the synchronization mark will not be delivered to the other NS user before the synchronization mark is received. N_RESET_REQ: This primitive requests that the NS provider reset the network connection. N_RESET_RES: This primitive indicates to the NS provider that the NS user has accepted a reset indication. N_RESET_IND: This primitive indicates to the NS user that the network connection has been reset. N_RESET_CON: This primitive indicates to the NS user that the reset request has been confirmed. The sequence of primitives as shown in Figure 12, Figure 13, Figure 14 and Figure 15 may remain in complete if a N_DISCON primitive occurs. The NC release procedure is initialized by the insertion of a disconnect object (associated with a N_DISCON_REQ) into the queue. 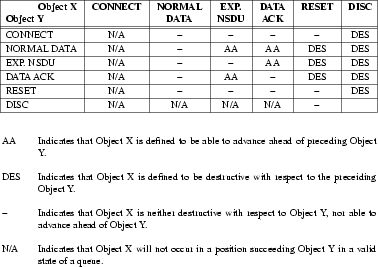 As shown in Table 3, the disconnect procedure is destructive with respect to other objects in the queue, and eventually results in the emptying of queues and termination of the NC connection. invoked independently by one NS user and the NS provider, with a request from the originating NS user and an indication to the other. N_DISCON_REQ: This primitive requests that the NS provider deny an outstanding request for a connection or disconnect an existing connection. N_DISCON_IND: This primitive indicates to the NS user that either a request for connection has been denied or an existing connection has been terminated. The sequence of primitives are shown in the time sequence diagrams in Figure 16, Figure 17, Figure 18 and Figure 19. A NS user may reject an NC establishment attempt by issuing a N_DISCON_REQ. The originator parameter in the N_DISCON primitives will indicate NS user invoked release. The sequence of events is shown in Figure 20. 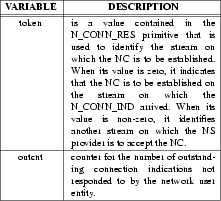 If the NS provider is unable to establish an NC, it indicates this to the requester by an N_DISCON_IND. The originator in this primitive indicates an NS provider invoked release. This is shown in Figure 21. The CLNS allows for the transfer of the NS user data in one or both directions simultaneously without establishing a network connection. 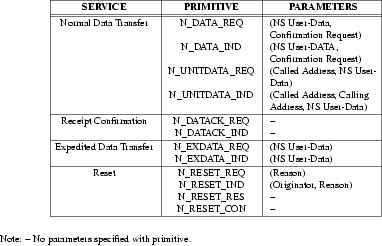 A set of primitives are defined that carry user data and control information between the NS user and NS provider entities. The primitives are modelled as requests initiated by the NS user and indications initiated by the NS provider. Indications may be initiated by the NS provider independently from requests by the NS user. The connectionless network service consists of one phase. N_UNITDATA_REQ: This primitive requests that the NS provider send the data unit to the specified destination. N_UNITDATA_IND: This primitive indicates to the NS user that a data unit has been received from the specified source address. Figure 22 shows the sequence of primitives for the connectionless mode of data transfer. N_UDERROR_IND: This primitive indicates to the NS user that the data unit with the specified destination address and QOS parameters produced an error. This primitive is specific to CLNS. Figure 23 shows the sequence of primitives for the CLNS error management primitive. This section describes the format and parameters of the NPI primitives (Mapping NPI to ISO 8348 and CCITT X.213, shows the mapping of the NPI primitives to the primitives defined in ISO 8348 (see ISO8348) and CCITT X.213 (see X.213)). In addition, it discusses the states the primitive is valid in, the resulting state, and the acknowledgement that the primitive expects. (The state/event tables for these primitives are shown in State/Event Tables. 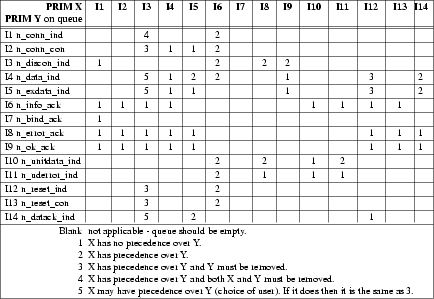 The precedence tables for the NPI primitives are shown in Primitive Precedence Tables.) Rules for OSI conformance are described in Addendum for OSI Conformance, to this document. Table 5, Table 6 and Table 7 provide a summary of the NS primitives and their parameters. These primitives apply both to CONS as well as CLNS. This primitive requests the NS provider to return the values of all supported protocol parameters (see N_INFO_ACK), and also the current state of the NS provider (as defined in State/Event Tables). This primitive does not affect the state of the network provider and does not appear in the state tables. This primitive is valid in any state where a local acknowledgement is not pending. The new state remains unchanged. Successful: Acknowledgement of the primitive via the N_INFO_ACK primitive. Non-fatal_errors: There are no errors associated with the issuance of this primitive. This primitive indicates to the NS user any relevant protocol-dependent parameters.1 It should be initiated in response to the N_INFO_REQ primitive described above. Specifies the maximum size (in octets) of a Network Service Data Unit (NSDU) supported by the NS provider. Specifies the maximum size (in octets) of an Expedited Network Service Data Unit (ENSDU) supported by the NS provider. Specifies the maximum number of octets of data that may be associated with connection establishment primitives. Specifies the maximum number of octets of data that may be associated with the disconnect primitives. Specifies the maximum size (in decimal digits) of a network address. Specifies the length in bytes of the network address bound on the STREAM on which the N_INFO_REQ was issued (a network address is bound to a STREAM via a N_BIND_REQ). Specifies the offset of the bound network address from the beginning of the M_PCPROTO message block (this field should be ignored if the ADDR_length field is zero). in an addendum to this document. In the connection-mode environment, when this primitive is invoked before the NC is established on the stream, the values returned specify the the default values supported by the NS provider. When this primitive is invoked after a NC has been established on the stream, the values returned indicate the negotiated values for the QOS parameters. 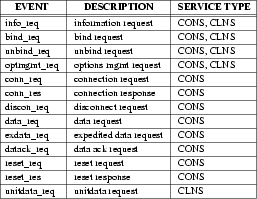 In the connection-less environment, these values represent the default or the selected QOS parameter values. In case a QOS parameter is not supported by the NS Provider, a value of QOS_UNKNOWN will be returned. In the case where no QOS parameters are supported by the NS provider, this field will be zero. Indicates the offset of the QOS parameters from the beginning of the M_PCPROTO message block. Indicates the length in bytes, of the available range of QOS parameters values supported by the NS provider. These ranges are used by the NS user to select QOS parameter values that are valid with the NS provider. QOS parameter values are selected, or the default values altered via the N_OPTMGMT_REQ primitive. In the connection-mode environment, the values for end-to-end QOS parameters may be specified with the N_CONN primitives for negotiation. If the NS provider does not support a certain QOS parameter, its value will be set to QOS_UNKNOWN. In the case where no QOS parameters are supported by the NS provider, the length of this field will be zero. Indicates the offset of the range of QOS parameter values from the beginning of the M_PCPROTO message block. Defines flags that indicate whether the options described below are supported by the NS provider. The possible options are receipt confirmation, expedited data and default selection for use of receipt confirmation. This indicates the amount of user data that may be present in a N_DATA primitive. The NIDU_size should not be larger than the NSDU_size specification. Specifies the service type supported by the NS provider. The possible values can be N_CONS, N_CLNS, (or both as indicated by using N_CONS|N_CLNS). This indicates the current state of the NS provider. This indicates the type of NS provider. The possible values can be N_SNICFP or N_SUBNET. The value N_SNICFP indicates that the provider is the Subnetwork Independent Convergence Function/Protocol sub-layer of the network layer. The value N_SUBNET indicates that the provider is a subnetwork. This specifies the optimal NSDU size (in octets) of an NSDU given the current routing information. This specifies the length of the protocol ids that were bound using the N_BIND_REQ. This specifies the offset of the protocol ids that were bound using the N_BIND_REQ. This indicates the current version of NPI that is supported. When set, it indicates that the NS provider supports receipt confirmation. This flag is used only in the connection-mode environment. When set, it indicates that the NS provider supports expedited data transfer. When set, it indicates that the default selection is for the use of receipt confirmation for every N_DATA_REQ primitive (This parameter is applicable only when use of receipt confirmation is successfully negotiated via the N_CONN primitives). When set, it indicates that the NS provider supports connection-mode network services. When set, it indicates that the NS provider supports connection-less network services. This primitive is valid in any state in response to a N_INFO_REQ primitive. The state remains the same. This primitive requests that the NS provider bind a NS user entity to a network address and negotiate the number of connect indications allowed to be outstanding by the NS provider for the specified NS user entity being bound. Is the length in bytes of the network address to be bound to the stream. Is the offset from the beginning of the M_PROTO block where the network address begins. Is the requested number of connect indications allowed to be outstanding by the NS provider for the specified protocol address. (If the number of outstanding connect indications equals CONIND_number, the NS provider need not discard further incoming connect indications, but may choose to queue them internally until the number of outstanding connect indications drops below the CONIND_number.) Only one stream per network address is allowed to have a CONIND_number value greater than zero. This indicates to the network provider that this stream is the listener stream for the NS user. This stream will be used by the NS provider for connect indications for that network address. If a stream is bound as a listener stream, it will not be able to initiate connect requests. If the NS user attempts to send an N_CONN_REQ primitive down this stream, an N_ERROR_ACK message will be sent to the NS user by the NS provider with an error value of NACCESS. This field should be ignored in CLNS. Is the length in bytes of the protocol ids to be bound to the stream. Is the offset from the beginning of the M_PROTO block where the protocol id begins. When set, this flag indicates that this stream is the “default listener stream”. This stream is used to pass connect indications for all incoming calls that contain protocol identifiers that are not bound to any other listener, or when a listener stream with CONIND_number value of greater than zero is not found. Also, the default listener will receive all incoming call indications that contain no user data. Only one default listener stream is allowed per occurrence of NPI. An attempt to bind a default listener stream when one is already bound should result in an error (of type NBOUND). The DEFAULT_LISTENER flag is ignored in CLNS. When set, this flag indicates to the NS provider that the NS user has requested that a “token” be assigned to the stream (to be used in the NC response message), and the token value be returned to the NS user via the N_BIND_ACK primitive. The token assigned by the NS provider can then be used by the NS user in a subsequent N_CONN_RES primitive to identify the stream on which the NC is to be established. The TOKEN_REQUEST flag is ignored in CLNS. When set, this flag indicates that this stream is the “default destination stream.” This stream will receive all packets destined for the NSAP specified in the bind request. If no NSAP is indicated in the bind request, then this stream should receive all packets destined to an NSAP which is bound to no other stream. Only one default destination stream per NSAP is allowed per occurrence of NPI. An attempt to bind a default destination stream to an NSAP when one is already bound should result in an error of type NBOUND. The DEFAULT_DEST flag is ignored in the CONS. This primitive is valid in state NS_UNBND (see State/Event Tables). The new state is NE_WACK_BREQ. Successful: Correct acknowledgement of the primitive is indicated using the N_BIND_ACK primitive. The network address was in an incorrect format or the address contained illegal information. It is not intended to indicate protocol errors. The NS user attempted to bind a second stream to a network address with the CONIND_number set to a non-zero value, or attempted to bind a second stream with the DEFAULT_LISTENER flag value set to non-zero. The NS provider could not allocate an address. The user did not have proper permissions for the use of the requested address. The primitive was issued from an invalid state. A system error has occurred and the UNIX® system error is indicated in the primitive. Protocol identifier could not be allocated. This primitive indicates to the NS user that the specified network user entity has been bound to the requested network address and that the specified number of connect indications are allowed to be queued by the NS provider for the specified network address. Is the length of the network address that was bound. Is the offset from the beginning of the M_PCPROTO block where the network address begins. Is the accepted number of connect indications allowed to be outstanding by the NS provider for the specified network address. If its value is zero, this stream cannot accept N_CONN_IND messages. If its value is greater than zero, then the NS user can accept N_CONN_IND messages up to the value specified in this parameter before having to respond with a N_CONN_RES or a N_DISCON_REQ message. This field should be ignored for CLNS. Conveys the value of the “token” assigned to this stream that can be used by the NS user in a N_CONN_RES primitive to accept a NC on this stream. It is a non-zero value, and is unique to all streams bound to the NS provider. Conveys the length of the protocol ids that were bound. Conveys the offset of the protocol ids that were bound. The proper alignment of the address in the M_PCPROTO message block is not guaranteed. If the ADDR_length field in the N_BIND_REQ primitive is zero, then the NS provider is to assign a network address to the user. The NS provider is to bind the network address as specified in the N_BIND_REQ primitive. If the NS provider cannot bind the specified address, it may assign another network address to the user. It is the network user's responsibility to check the network address returned in the N_BIND_ACK primitive to see if it is the same as the one requested. The CONIND_number in the N_BIND_ACK primitive must be less than or equal to the corresponding requested number as indicated in the N_BIND_REQ primitive. Only one stream that is bound to the indicated network address may have a negotiated accepted number of maximum connect requests greater than zero. If a N_BIND_REQ primitive specifies a value greater than zero, but another stream has already bound itself to the given network address with a value greater than zero, the NS provider should assign another protocol address to the user. If a stream with CONIND_number greater than zero is used to accept a connection,the stream will be found busy during the duration of that connection and no other streams may be bound to that network address with a CONIND_number greater than zero. This will prevent more than one stream bound to the identical network address from accepting connect indications. A stream requesting a CONIND_number of zero should always be legal. This indicates to the NS provider that the stream is to be used to request connections only. A stream with a negotiated CONIND_number greater than zero may generate connect requests or accept connect indications. If the above rules result in an error condition, then the NS provider must issue an N_ERROR_ACK primitive to the NS user specifying the error as defined in the description of the N_BIND_REQ primitive. This primitive is in response to a N_BIND_REQ primitive and is valid in the state NS_WACK_BREQ. The new state is NS_IDLE. This primitive requests that the NS provider unbind the NS user entity that was previously bound to the network address. This primitive is valid in the NS_IDLE state. The new state is NS_WACK_UREQ. Successful: Correct acknowledgement of the primitive is indicated via the N_OK_ACK primitive, see N_OK_ACK. This primitive allows the NS user to manage the QOS parameter values associated with the stream. Indicates the length of the default values of the QOS parameters as selected by the NS user. In the connection-mode environment these values will be used in subsequent N_CONN_REQ primitives on the stream that do not specify values for these QOS parameters. 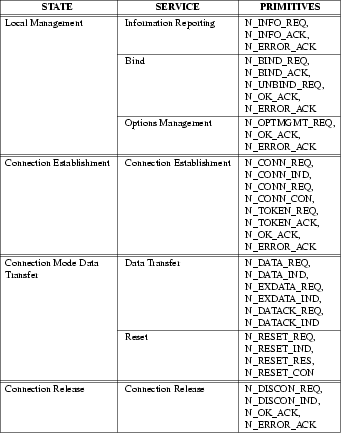 In the connection-less environment, these values represent the selected QOS values that would apply to each unit data transmission. If the NS user cannot determine the value of a QOS parameter, its value should be set to QOS_UNKNOWN. If the NS user does not specify any QOS parameter values, the length of this field should be set to zero. Indicates the offset of the QOS parameters from the beginning of the M_PROTO message block. When set, it indicates to the NS provider that the NS user's default selection is for the use of receipt confirmation with every N_DATA_REQ message (applicable only when its use is successfully negotiated via the N_CONN primitives). This default indication is used only when the M_PROTO message block is not present in the N_DATA_REQ primitive. This flag should be ignored in the connection-less environment. The new state is NS_WACK_OPTREQ. Successful: Acknowledgement is via the N_OK_ACK primitive. At successful completion, the resulting state is NS_IDLE. The QOS parameter values specified are outside the range supported by the NS provider. The QOS structure type is not supported by the NS provider. This primitive indicates to the NS user that a non-fatal error has occurred in the last network-user-originated primitive. This may only be initiated as an acknowledgement for those primitives that require one. It also indicates to the user that no action was taken on the primitive that caused the error. Identifies the primitive type that caused the error. Contains the Network Provider Interface error code. Contains the UNIX® system error code. This may only be non-zero if the NPI_error is equal to NSYSERR. The network address as specified in the primitive was in an incorrect format, or the address contained illegal information. The options values as specified in the primitive were in an incorrect format, or they contained illegal information. The QOS values specified are outside the range supported by the NS provider. illegal. Token used is not associated with an open stream. The user did not have proper permissions. The sequence number specified in the primitive was incorrect or illegal. The flags specified in the primitive were incorrect or illegal. The amount of user data specified was outside the range supported by the NS provider. Specified primitive type is not known to the NS provider. This primitive is valid in all states that have a pending acknowledgement or confirmation. The new state is the same as the one from which the acknowledged request or response was issued. This primitive indicates to the NS user that the previous network- user-originated primitive was received successfully by the network provider. It does not indicate to the NS user any network protocol action taken due to the issuance of the last primitive. The N_OK_ACK primitive may only be initiated as an acknowledgement for those user originated primitives that have no other means of confirmation. Identifies the successfully received primitive type. This section describes the format of the CONS primitives and the rules associated with these primitives. The default values of the QOS parameters associated with a NC may be selected via the N_OPTMGMT_REQ primitive. The following network service primitives pertain to the establishment of an NC, provided the NS users exist, and are known to the NS provider. This primitive requests that the NS provider make a network connection to the specified destination. The format of the message is one M_PROTO message block followed by one or more M_DATA blocks for the NS user data transfer. The specification of the NS user data is optional. The NS user can send any integral number of octets of data within the range supported by the NS provider (see see N_INFO_ACK). If the user does not specify QOS parameter values, the default values (specified via N_OPTMGMT_REQ) are used by the NS provider. Indicates the length of the destination address parameter that conveys an address identifying the NS user to which the NC is to be established. This field will accommodate variable length addresses within a range supported by the NS provider. Is the offset of the destination address from the beginning of the M_PROTO message block. Indicates the length of the QOS parameters values that apply to the NC being requested. If the NS user cannot determine the value of a QOS parameter, its value should be set to QOS_UNKNOWN. If the NS user does not specify any QOS parameter values, the length of this field should be set to zero. The receipt confirmation selection parameter indicates the use/availability of the receipt confirmation service on the NC. The receipt confirmation service must be supported by the NS provider to be used on the NC. Indicates the use of the expedited data transfer service on the NC. The expedited data transfer service must be provided by the NS provider for it to be used on the NC. This primitive is valid in state NS_IDLE. The new state is NS_WCON_CREQ. Successful NC Establishment: This is indicated via the N_CONN_CON primitive. This results in the data transfer state. Unsuccessful NC Establishment: This is indicated via the N_DISCON_IND primitive. For example, a connection may be rejected because either the called NS user cannot be reached, or the NS provider and/or the called NS user did not agree with the specified QOS. This results in the idle state. The user did not have proper permissions for the use of the requested address or options. The network address was in an incorrect format or contained illegal information. It is not intended to indicate NC errors, such as an unreachable destination. These errors types are indicated via the N_DISCON_IND primitive. The options were in an incorrect format, or they contained illegal information. This primitive indicates to the destination NS user that a network connect request has been made by the user at the specified source address. The format of this message is one M_PROTO message block followed by one or more M_DATA blocks for NS user data. The specification of NS user data is optional. The NS user can send any integral number of octets of data within the range supported by the NS provider. The NS user data will only be present if the corresponding N_CONN_REQ had NS user data parameter specified, and their data will be identical. Indicates the length of the destination address parameter that conveys an address identifying the NS user to which the NC is to be established. Is the offset of the destination address from the beginning of theM_PROTO message block. The source address parameter conveys the network address of the NS user from which the NC has been requested. The semantics of the value in the N_CONN_IND primitive is identical to the value associated with the stream on which the N_CONN_REQ was issued. Identifies the sequence number that can be used by the NS user to associate this message with the N_CONN_RES or N_DISCON_REQ primitive that is to follow. This value must be unique among the outstanding N_CONN_IND messages. The use of this field allows the NS user to issue the N_CONN_RES or the N_DISCON_REQ messages in any order. Indicates the length of the QOS parameters values that are negotiated during NC establishment. If the destination NS user does not agree to the range of QOS values specified by the source NS user in the N_CONN_REQ primitive, it will reject the NC establishment by invoking a N_DISCON_REQ primitive(the originator parameter in the N_DISCON_REQ primitive will indicate NS user initiated release). If the NS user does not support or cannot determine the value of a QOS parameter, its value will be set to QOS_UNKNOWN. If the NS user does not specify any QOS parameter values, the length of this field should be set to zero. The receipt confirmation selection parameter indicates the use/availability of the receipt confirmation service on the NC. The receipt confirmation service must be provided in the network service to be used on the NC. The expedited data selection parameter indicates the use/ availability of the expedited data transfer service on the NC. The expedited data transfer service must be provided by the NS provider for it to be used on the NC. Valid States This primitive is valid in the states NS_IDLE and NS_WRES_CIND. New State In both cases the resulting state is NS_WRES_CIND (the number of connect indications waiting for user response is incremented by one). This primitive allows the destination NS user to request that the network provider accept a previous connect request. The format of this message is one M_PROTO message block followed by one or more M_DATA blocks (for NS user data). The specification of the NS user data is optional. The NS user can send any integral number of octets of data within the range supported by the NS provider. Is used to identify the stream that the NS user wants to establish the NC on. (Its value is determined by the NS user by issuing a N_BIND_REQ primitive with the TOKEN_REQUEST flag set.The token value is returned in the N_BIND_ACK). The value of this field should be non-zero when the NS user wants to establish the NC on a stream other than the stream on which the N_CONN_IND arrived. If the NS user wants to establish a NC on the same stream that the N_CONN_IND arrived on, then the value of this field should be zero. Indicates the length of the responding address parameter that conveys the network address of the NS user to which the NC has been established. Under certain circumstances, such as call redirection, generic addressing, etc., the value of this parameter may be different from the destination address parameter specification in the corresponding N_CONN_REQ. Indicates the offset of the responding address from the beginning of the M_PROTO message block. Indicates the sequence number of the N_CONN_RES message.It is used by the NS provider to associate the N_CONN_RES message with an outstanding N_CONN_IND message. An invalid sequence number should result in error with the message type NBADSEQ. Indicates the length of the QOS parameters values that are negotiated during NC establishment. If the NS user does not agree to the QOS values, it will reject the NC establishment by invoking a N_DISCON_REQ primitive (the originator parameter in the N_DISCON_REQ primitive will indicate NS user invoked release). If the NS user cannot determine the value of a QOS parameter, its value should be set to QOS_UNKNOWN. If the NS user does not specify any QOS parameter values, the length of this field should be set to zero. The expedited data selection parameter indicates the use/availability of the expedited data transfer service on the NC. The expedited data transfer service must be provided by the NS provider for it to be used on the NC. This primitive is valid in state NS_WRES_CIND. The new state is NS_WACK_CRES. Successful: Successful completion is indicated via the N_OK_ACK primitive. The token specified is not associated with an open stream. The user did not have proper permissions for the use of the options of the options or response id. This primitive indicates to the source NS user that the network connect request has been confirmed on the specified responding address. The NS user can send any integral number of octets of NS user data within a range supported by the NS provider (see N_INFO_ACK). The NS user data will only be present if the corresponding N_CONN_RES had NS user data specified with it, and their data will always be identical. Indicates the length of the responding address parameter that conveys the network address of the NS user entity to which the NC has been established. 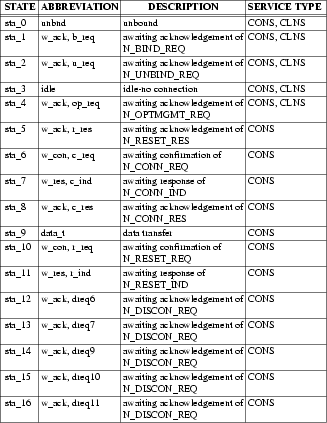 The semantics of the values in the N_CONN_CON is identical to the values in N_CONN_RES. Under certain circumstances, such as call redirection, generic addressing, etc., the value of this parameter may be different from the destination address parameter specification in the corresponding N_CONN_REQ. Indicates the length of the QOS parameters values selected by the responding NS user. If the NS provider does not support or cannot determine the selected value of a QOS parameter, its value will be set to QOS_UNKNOWN. If the NS provider does not specify any QOS parameter values, the length of this field should be set to zero. The expedited data selection parameter indicates the use/ availability of the expedited data transfer service on the NC. The expedited data transfer service must be provided by the NS provider for it to be used on the NC. Valid States This primitive is valid in state NS_WCON_CREQ. New State The new state is NS_DATA_XFER. The data transfer service primitives provide for an exchange of NS user data known as NSDUs, in either direction or in both directions simultaneously on a NC. The network service preserves both the sequence and the boundaries of the NSDUs (when the NS provider supports NSDUs). This user-originated primitive indicates to the NS provider that this message contains NS user data. It allows the transfer of NS_user_data between NS users, without modification by the NS provider. The NS user must send any integral number of octets of data greater than zero. In a case where the size of the NSDU exceeds the NIDU (as specified by the size of the NIDU_size parameter of the N_INFO_ACK primitive), the NSDU may be broken up into more than one NIDU. When an NSDU is broken up into more than one NIDU, the N_MORE_DATA_FLAG will be set on each NIDU except the last one. The RC_flagmay only be set on the last NIDU. to indicate whether receipt confirmation is desired for the NSDU. receipt confirmation has been successfully negotiated for use or non-use and the default selection as specified via the N_OPTMGMT primitive is to be used. receipt confirmation has been successfully negotiated for use and the default selection as specified via N_OPTMGMT_REQ primitive needs to be overridden. When set, the N_MORE_DATA_FLAG indicates that the next N_DATA_REQ message (NIDU) is also part of this NSDU. By setting this flag on the N_DATA_REQ, the originating NS user can request confirmation of receipt of the N_DATA primitive. The receipt is provided by the N_DATACK primitives. The parameter may only be present if use of Receipt Confirmation was agreed by both NS users and the NS provider during NC establishment. This primitive is valid in the NS_DATA_XFER state. The resulting state remains the same (NS_DATA_XFER). The network interface was found to be in an incorrect state. The amount of NS user data associated with the primitive is outside the range supported by the NS provider (as specified by the NIDU_size parameter of N_INFO_ACK primitive). The options requested are either not supported by the NS provider or its use not specified with the N_CONN_REQ primitive. 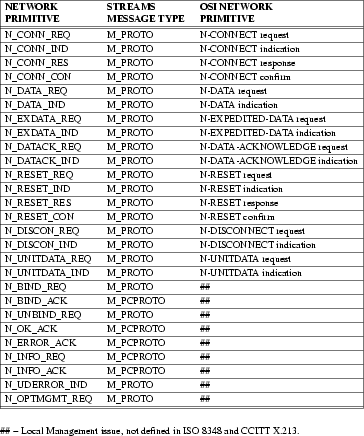 The M_PROTO message block was not followed by one or more M_DATA message blocks. The N_RC_FLAG and N_MORE_DATA_FLAG were both set in the primitive, or the flags field contained an unknown value. NOTE: If the interface is in the NS_IDLE or NS_WRES_RIND states when the provider receives the N_DATA_REQ primitive, then the NS provider should discard the request without generating a fatal error. This network-provider-originated primitive indicates to the NS user that this message contains NS user data. As in the N_DATA_REQ primitive, the NSDU can be segmented into more than one NIDUs. The NIDUs are associated with the NSDU by using the N_MORE_DATA_FLAG. The N_RC_FLAG is allowed to be set only on the last NIDU. The format of the message is one or more M_DATA message blocks. The value of the NS user data field is always the same as that supplied in the corresponding N_DATA_REQ primitive at the peer service access point. Use of M_PROTO message blocks is optional (see guidelines under see N_DATA_REQ). When set, indicates that the next N_DATA_IND message (NIDU) is part of this NSDU. The value of the parameter may indicate either that confirmation is requested or that it is not requested. The parameter is allowed to be set only if use of Receipt Confirmation was agreed to between both the NS users and the NS provider during NC establishment. The value of this parameter is always identical to that supplied in the corresponding N_DATA_REQ primitive. This primitive is valid in state NS_DATA_XFER. The receipt confirmation service is requested by the confirmation request parameter on the N_DATA_REQ primitive. For each and every NSDU with the confirmation request parameter set, the receiving NS user should return an N_DATACK_REQ primitive.Such acknowledgements should be issued in the same sequence as the corresponding N_DATA_IND primitives are received, and are to be conveyed by the NS provider in such a way so as to preserve them distinct from any previous or subsequent acknowledgements. The NS user may thus correlate them with the original requests by counting. When an NSDU has been segmented into more than one NIDUs, only the last NIDU is allowed to request receipt confirmation. N_DATACK_REQ primitives will not be subject to the flow control affectingN_DATA_REQ primitives at the same NC endpoint. N_DATACK_IND primitives will not be subject to the flow control affecting N_DATA_IND primitives at the same NC endpoint. The use of the receipt confirmation service must be agreed to by the two NS users of the NC and the NS provider during the NC establishment by using the RC_selection parameter on the N_CONN primitives. This is a user-originated primitive that requests that the network provider acknowledge the N_DATA_IND that had previously been received with the receipt confirmation parameter set. NOTE: If the interface is in the NS_IDLE state when the provider receives the N_DATACK_REQ primitive, then the NS provider should discard the request without generating a fatal error. If the NS provider had no knowledge of a previous N_DATA_IND with the receipt confirmation flag set, then the NS provider should just ignore the request without generating a fatal error. This is a NS provider originated primitive that indicates to the network service user that the remote network service user has acknowledged the data that had previously been sent with the receipt confirmation set. The expedited data transfer service provides a further means of information exchange on an NC in both directions simultaneously. The transfer of expedited network service data unit (ENSDU) is subject to separate flow control from that applying to NS user data (However, a separate STREAMS message type for expedited data is not available with UNIX® System V Release 3.1 . Until a new STREAMS message type is provided, expedited data will be implemented via queue manipulation). The NS provider should guarantee that an expedited-NSDU will not be delivered after any subsequently issued NSDU or expedited-NSDU on that NC. The relationship between normal and expedited data is shown in Table 2. Expedited data can still be delivered when the receiving NS user is not accepting normal data (however this cannot be guaranteed if there are blockages occurring in the lower layers). The expedited data transfer service is a NS provider option, and its use must be agreed by the two NS users of the NC and the NS provider during NC establishment by using the EX_DATA_OPT parameter on the N_CONN primitives. This is a NS user originated primitive and is used to indicate to the network provider that the message block contains an ENSDU. The format of the message is one M_PROTO message block, followed by one or more M_DATA blocks. The NS user must send an integral number of octets of data within the range supported by the NS provider (see N_INFO_ACK). The amount of NS user data associated with the primitive defines an expedited network service data unit of a size that is outside the range supported by the NS provider. Expedited data transfer is either not supported by the NS provider or not requested with the N_CONN_REQ primitive. NOTE: If the interface is in the NS_IDLE or NS_WRES_RIND states when the provider receives the N_EXDATA_REQ primitive, then the NS provider should discard the request without generating a fatal error. This is a NS provider originated primitive and is used to indicate to the NS user that this message contains an ENSDU. The format of the message is one M_PROTO message block, followed by one or more M_DATA blocks. 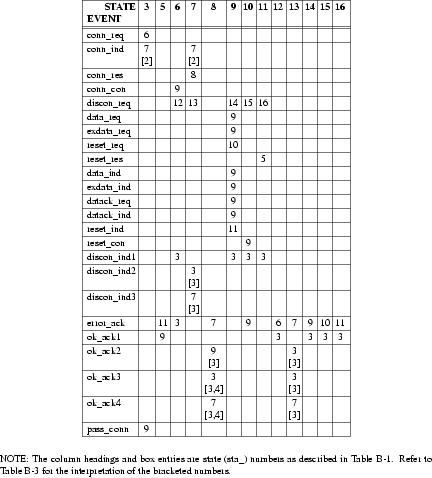 The value of the data in the M_DATA blocks is identical to that supplied with the corresponding N_EXDATA_REQ primitive. The reset service can be used by the NS user to resynchronize the use of the NC; or by the NS provider to report detected loss of data unrecoverable within the network service. All loss of data which does not involve loss of the NC is reported in this way. Invocation of the reset service will unblock the flow of NSDUs and ENSDUs in case of congestion of the NC; it will cause the NS provider to discard NSDUs, ENSDUs, or confirmations of receipt associated with the NC (See Table 1), and to notify any NS user or users that did not invoke reset that a reset has occurred. The service will be completed in finite time,irrespective of the acceptance of the NSDUs, ENSDUs, and confirmations of receipt by the NS users. This user-originated primitive requests that the NS provider reset the network connection. Gives information indicating the cause of the reset. The resulting state is NS_WACK_RREQ. Successful: This primitive does not require an immediate acknowledgement, although when the resynchronization completes successfully, a N_RESET_CON primitive is issued to the NS user that issued the N_RESET_REQ. A system error has occurred and the UNIX® system error is indicated with the N_ERROR_ACK primitive. NOTE: If the interface is in the NS_IDLE state when the provider receives the N_RESET_REQ primitive, then the NS provider should discard the message without generating an error. This network-provider-originated primitive indicates to the NS user that the network connection has been reset. This parameter indicates the source of the reset. The new state is NS_WRES_RIND. This user-originated primitive indicates that the NS user has accepted a reset request. This primitive is valid in state NS_WRES_RIND. The new state is NS_WACK_RRES. Successful: The successful completion of this primitive is indicated via the N_OK_ACK primitive. This results in the data transfer state. A system error has occurred and the UNIX® system error is indicated in the N_ERROR_ACK primitive. NOTE: If the interface is in the NS_IDLE state when the provider receives the N_RESET_RES primitive, then the NS provider should discard the message without generating an error. This NS provider-originated primitive indicates to the network user that initiated the reset, that the reset request has been confirmed. The NS provider is allowed to issue the N_RESET_CON primitive to the NS user that initiated the reset even before receiving a N_RESET_RES. This primitive is valid in state NS_WCON_RREQ. The resulting state is NS_DATA_XFER. by the NS provider to indicate its inability to establish a requested NC. An NC release is permitted at any time regardless of the current phase of the NC. Once an NC release procedure has been invoked, the NC will be released; a request for release cannot be rejected. The network service does not guarantee delivery of any data once the NC release phase is entered (see Table 1). This user-originated primitive requests that the NS provider deny a request for a network connection, or disconnect an existing connection. The format of the message is one M_PROTO message block, followed by one or more M_DATA message blocks (for NS user data). The NS user data may be lost if the NS provider initiates release before the N_DISCON_IND is delivered. Therefore, the NS user data parameter is present only if the originator parameter (see N_DISCON_IND) indicates that the release was originated by an NS user. The NS user may send any integral number of octets of data within a range supported by the NS provider (see N_INFO_ACK). Gives information about the cause of the release. Indicates the length of the address of the responding address parameter. The responding address parameter is an optional parameter, and is present in the primitive only in the case where the primitive is used to indicate rejection of an NC establishment attempt by an NS user. The responding address parameter conveys the network address of the NS user entity from which the N_DISCON_REQ was issued and under certain circumstances (e.g. call redirection, generic addressing, etc.) may be different from the “destination address” in the corresponding N_CONN_REQ primitive. Is the offset from the beginning of the M_PROTO message block where the network address begins. When non-zero, it identifies the sequence number of the N_CONN_IND message being rejected. This number is used by the NS provider to associate the N_DISCON_REQ with an unacknowledged N_CONN_IND that is to be rejected. If the N_DISCON_REQ is rejecting a NC that is already established(or rejecting a N_CONN_REQ that the NS user had previously sent and has not yet been confirmed), then this field should have a value of ‘0’. This primitive is valid in states NS_WCON_CREQ, NS_WRES_CIND, NS_DATA_XFER, NS_WCON_RREQ, NS_WRES_RIND. The new state depends on the original state (see Table B-8). The specified sequence number referred to an invalid N_CONN_IND message, or the N_DISCON_REQ is rejecting an NC that is already established (or rejecting anN_CONN_REQ that the NS user had previously sent and has not yet been confirmed) and the value of the sequence number is not ‘0’. This network-provider originated primitive indicates to the NS user that either a request for connection has been denied or an existing connection has been disconnected. The format of the message is one M_PROTO message block, followed by one or more M_DATA blocks. The value of the NS user data parameter is identical to the value in the corresponding N_DISCON_REQ primitive. The NS user data parameter is present only if the originator parameter indicates that the release was initiated by the NS user. Indicates the source of the NC release. Indicates the length of the address of the responding address parameter. The responding address parameter is an optional parameter, and is present in the primitive only in the case where the primitive is used to indicate rejection of an NC establishment attempt by an NS user. When not present, the value of this parameter is zero. When present, the value of the disconnect address parameter is identical to that supplied with the corresponding N_DISCON_REQ primitive. When its value is non-zero, it identifies the sequence number associated with the N_CONN_IND that is being aborted. indicating the release of a NC that is already successfully established. When this field is non-zero and its value is the same as the sequence number assigned to an unacknowledged N_CONN_IND, it indicates that the NS provider is canceling the unacknowledged N_CONN_IND. The new state is NS_IDLE (except when number of outstanding connect indications is greater than 1, in which case the resulting state is NS_WRES_CIND). This section describes the format of the CLNS primitives and the rules associated with these primitives. The values of the QOS parameters associated with each unit data transmission are selected via the N_OPTMGMT_REQ primitive. This primitive requests that the NS provider send the specified datagram to the specified destination. The format of the message is one M_PROTO message block followed by one or more M_DATA message blocks. Indicates the length of the destination address. Indicates the offset of the destination address from the beginning of the M_PROTO message block. This is a reserved field (for compatibility with DLPI) whose value must be set to zero for both entries of the array. The resulting state remains unchanged. Successful: There is no acknowledgement for the successful completion of this primitive. The network service interface was found to be in an incorrect state. The amount of NS user data associated with the primitive defines a network service data unit larger than that allowed by the NS provider. This primitive indicates to the NS user that a datagram has been received from the specified source address. Indicates the length of the destination address. The address is the same as in the corresponding N_UNITDATA_REQ primitive. Indicates the length of the source network address. This address is the same as the value associated with the stream on which the N_UNITDATA_REQ was issued. Indicates the offset of the source address from the beginning of the M_PROTO message block. This packet experienced congestion during its delivery. This primitive indicates to the NS user that a datagram with the specified destination address and QOS parameters has resulted in an error condition. This field is reserved whose value must be set to zero. Specifies the reason for the error. Two error handling facilities should be provided to the network service user: one to handle non-fatal errors, and the other to handle fatal errors. These are errors that do not change the state of the network service interface as seen by the network service user, and provide the user the option of reissuing the network service primitive with the corrected options specification. The non-fatal error handling is provided only to those primitives that require acknowledgements, and uses the N_ERROR_ACK to report these errors. These errors retain the state of the network service interface the same as it was before the network provider received the primitive that was in error. Syntax errors and rule violations are reported via the non-fatal error handling facility. These errors are issued by the NS provider when it detects errors that are not correctable by the network service user, or if it is unable to report a correctable error to the network service user. Fatal errors are indicated via the STREAMS message type M_ERROR with the UNIX® system error [EPROTO]. The M_ERROR STREAMS message type will result in the failure of all the UNIX® system calls on the stream. The network service user can recover from a fatal error by having all the processes close the files associated with the stream, and then reopening them for processing. This section describes the formats and rules that are specific to OSI. The addendum must be used along with the generic NPI as defined in the main document when implementing a NS provider that will be configured with the OSI Transport Layer. The “Quality of Service” characteristics apply to both CONS as well as CLNS. Those that are “negotiated” on a per-connection basis during NC establishment. (CLNS does not support end-to-end QOS parameter negotiation). Those that are not negotiated and their values are selected/determined by local management methods. 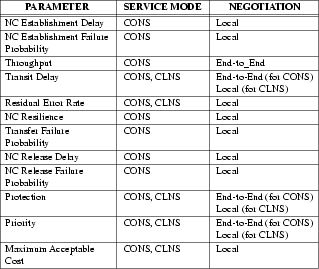 Table 8 summarizes the supported parameters both for connection-mode and connectionless network service. For more details on the definition of the QOS parameters, refer to CCITT X.213 (see X.213) and ISO 8348 (see ISO8348). This section describes the formats of the QOS parameters for CONS and/or CLNS services. The requested QOS parameter values apply to complete NSDUs. This parameter applies to CONS only. It is defined as the maximum acceptable delay between a N_CONN_REQ and the corresponding N_CONN_CON primitive. NC establishment delay is measured in milliseconds. Is the maximum acceptable delay value for NC establishment. This parameter applies to CONS only. NC Establishment Failure Probability is the percent ratio (rounded to the nearest integer) of total NC establishment failures to total NC establishment attempts in a measurement sample. A measurement sample consists of100 NC establishment attempts. NC establishment failure occurs due to NS provider behaviour such as mis-connection, NC refusal, and excessive delay. NC establishment attempts that fail due to NS user behaviour such as error, NC refusal, or excessive delay are excluded in calculating NC establishment failure probability. Is the maximum acceptable percent value (rounded to the nearest integer) for the NC establishment failure probability. the number of NS user data octets contained in the last “n-1” NSDUs divided bythe time between the first and the last N_DATA_INDs in the sequence. Throughput should be measured and specified in bits per second. Specifies the requested QOS value for throughput for data transfer between the two NS users. Specifies the requested lowest acceptable QOS value for throughput between the two NS users. This parameter applies to CONS as well as CLNS. Transit Delay is the elapsed time between a N_DATA_REQ and the corresponding N_DATA_IND (calculated on successfully transferred NSDUs only). The pair of values specified for an NC applies to both directions of transfer. The specified values are averages (based on 100 samples using a NSDU size of 128 bytes). Transit Delay should be measured in milliseconds. Specifies the desired QOS value for transit delay between the two NS users. Specifies the maximum QOS value that the source NS user will agree for transit delay between the two NS users. This parameter applies to both CONS as well as CLNS. Residual Error Rate is the percent ratio (rounded to the nearest integer) of total incorrect, lost, and duplicate NSDUs to total NSDUs transferred across the NS boundary during a measurement period. The measurement period will be 3600 seconds. Specifies the maximum acceptable percent value (rounded to the nearest integer) of the residual error rate. This parameter applies to CONS only. NC Resilience specifies the percent probability (rounded to the nearest integer) of a NS provider invoked NC release or a NS provider invoked reset during a specified time interval on an established NC. The time interval will be 3600 seconds. Specifies the maximum acceptable value for NC resilience. This parameter applies to CONS only. It is the percent ratio (rounded to the nearest integer) of total transfer failures to total transfer samples observed during a performance measurement. A transfer sample is a discrete observation of NS provider performance in transferring NSDUs between specified sending and receiving NS user. A transfer sample will last for the duration of the NC. A transfer failure is a transfer sample in which the observed performance is worse than the specified minimum acceptable level. A transfer failure is identified by comparing the measured values for the supported performance parameters with specified transfer failure thresholds. The three supported performance parameters are throughput, transit delay, and residual error rate. Specifies the maximum acceptable percent value (rounded to the nearest integer) for transfer failure probability. This parameter applies to CONS only. NC Release Delay is defined as the maximum acceptable delay between a NS user invoked N_DISCON_REQ and the successful release of the NC at the peer NS user. NC Release Delay is specified independently for each NS user. It does not apply in cases where NC release is invoked by the NS provider. NC release delay should be measured in milliseconds. Is the maximum acceptable value for NC release delay. This parameter applies to CONS only. It is the percent ratio (rounded to the nearest integer) of total NC release requests resulting in release failure to total NC release requests included in a measurement sample. A measurement sample consists of a 100NC release requests. This parameter is specified independently for each NS user. A release failure is defined to occur for a particular NS user, if that user does not receive a N_DISCON_IND within a specified maximum NC release delay of the NS user issuing the N_DISCON_REQ (given that the former NS user has not issued a N_DISCON_REQ). Is the maximum acceptable percent value (rounded to the nearest integer) of NC release failure probability. This parameter applies to both CONS and CLNS. It specifies the extent to which the NS provider attempts to prevent unauthorized monitoring or manipulation of NS user originated information. Specifies the target protection of the NS user originated information. Specifies the lowest quality acceptable of protection of the NS user originated information. This parameter applies to both CONS and CLNS. a NC (for CONS). The number of priority levels is limited to 15 (where level 1 is the highest priority and level 15 is the lowest priority). Specifies the target NC priority level. Specifies the lowest quality acceptable of the NC priority level. This parameter applies to both CONS and CLNS. It specifies the maximum acceptable cost in local currency (composed of communications and end-system resource costs), or indicates to the NS provider that it should choose the least expensive means available to it. Specifies the maximum acceptable cost in local currency. Quality of service range requested for connection-mode service as used with the N_CONN_REQ and N_CONN_IND primitives. Quality of service values selected for the connection-mode service as used with the N_CONN_RES and N_CONN_CON primitives. Range of quality of service values for connectionless-mode service as specified with the QOS_range_length and QOS_range_offset parameters of the N_INFO_ACK primitive. 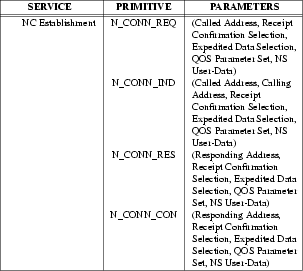 Quality of service values supported/selected for connectionless-mode service as specified with the QOS_length and QOS_offset parameters of the N_INFO_ACK and the N_OPTMGMT_REQ primitives. Range of quality of service values for connection-mode service as specified with the QOS_range_length and QOS_range_offset parameters of the N_INFO_ACK primitive. Default quality of service values supported/selected for connection-mode service as specified with the QOS_length and QOS_offset parameters of the N_INFO_ACK and the N_OPTMGMT_REQ primitives. QOS_length and QOS_offset fields of the N_OPTMGMT_REQ primitive. The following are the rules that apply to the NPI primitives for OSI compatibility. A value greater than zero specifies the maximum size of a Network Service Data Unit (NSDU); a value of ‘0’ specifies that the transfer of normal data is not supported by the NS provider,and a value of ‘-1’ specifies that there is no limit on the size of a NSDU. A value between 1 and 32 inclusive specifies the maximum size of an Expedited Network Service Data Unit (ENSDU); a value of ‘0’ specifies that the transfer of expedited data is not supported by the NS provider. A value between 1 and 128 inclusive specifies the maximum number of octets of data that may be associated with connection establishment primitives. A value of ‘0’ specifies that the NS provider does not allow data to be sent with connection establishment primitives. When used in an OSI conforming environment, CDATA_size shall always equal 128. A value between 1 and 128 inclusive specifies the maximum number of octets of data that may be associated with the disconnect primitives; a value of ‘0’ specifies that the NS provider does not allow data to be sent with the disconnect primitives. When used in an OSI conforming environment, DDATA_size shall always equal 128. A value between 1 and 40 indicates the maximum size of a network address in decimal digits. When used in an OSI conforming environment, ADDR_size shall always equal 40 in order to accommodate a full NSAP address. In the connection-mode environment, when this primitive is invoked before the NC is established on the stream, the values returned specify the the default values supported by the NS provider. When this primitive is invoked after a NC has been established on the stream, the values returned indicate the negotiated values for the QOS parameters. 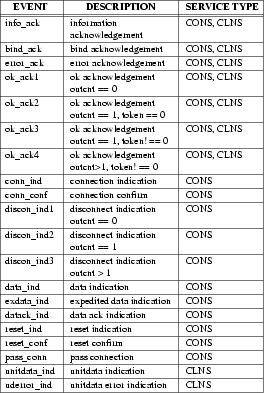 In the connectionless environment, these values represent the default or the selected QOS parameter values. In case a QOS parameter is not supported by the NS Provider, a value of QOS_UNKNOWN will be returned. In the case where no QOS parameters are supported by the NS provider, the length of this field will be zero. Indicates the length in bytes, of the available range of QOS parameters values supported by the NS provider. These ranges are used by the NS user to select QOS parameter values that are valid with the NS provider. QOS parameter values are selected, or the default values altered via the N_OPTMGMT_REQ primitive. In the connection-mode environment, the values for end-to-end QOS parameters may be specified with the N_CONN primitives for negotiation. If the NS provider does not support a certain QOS parameter, its value will be set to QOS_UNKNOWN. In the case where no QOS parameters are supported by the NS provider, the length of this field will be zero. This indicates the amount of user data that may be present in aN_DATA primitive. The NIDU_size should not be larger than the NSDU_size specification. The NSDU_size should be the same as the NIDU_size. The NODU_size specifies the optimal NSDU size in octets of an NSDU given the current routing information. The length of the protocol identifiers to be bound. The offset of the protocol identifiers to be bound, from the beginning of the block. If the NS user cannot determine the value of a QOS parameter,its value should be set to QOS_UNKNOWN. If the NS user does not specify any QOS parameter values, the length of this field should be set to zero. The value of each of these parameters must be within the limit of the allowable values defined for the network service. “Default” values for these parameters are supported by the NS provider. The default values may be selected by the NS user via the N_OPTMGMT_REQ primitive. the NS provider adopts the QOS value for the NC which was specified by the destination NS user and supplies this as a single parameter, “selected”, in the N_CONN_CON primitive. a value other than “unspecified” is specified for “Target” and the “Lowest Quality Acceptable” is “unspecified”. NOTE: In case where “Target” is “unspecified”, the “Lowest Quality Acceptable” must also be “unspecified”. In Case2 and Case3, if the NS provider does not agree to provide a QOS in the requested range, then the NC establishment attempt is rejected as described in clause 13.5 of ISO 8348 (see ISO8348). If the NS provider does agree to provide a QOS in the requested range, then in the N_CONN_IND primitive, the “Available” sub-parameter specifies the highest QOS value within the range which the NS provider is willing to provide. if the called NS user does agree, then the NS user specifies the value “unspecified” in the “Selected” sub-parameter of the N_CONN_RES primitive. if the called NS user does agree to a QOS in the identified range, then the NS user specifies the agreed value in the “Selected” sub-parameter of the N_CONN_RES primitive. In the N_CONN_CON primitive, the “Selected” sub-parameter has a value identical to that of “Selected” in the N_CONN_RES primitive. When a NS user/provider cannot determine the value of a QOS field, it should return a value of QOS_UNKNOWN. on the N_CONN_REQ, either of the defined values may occur (namely, “use of receipt confirmation”, or “no use of receipt confirmation”). on the N_CONN_IND, the value is either equal to the value on the request primitive, or is “no use of receipt confirmation”. on the N_CONN_RES, the value is either equal to the value on the indication primitive or is “no use of receipt confirmation”. on the N_CONN_CON, the value is equal to the value on the response primitive. if the source NS user requests it, the NS provider agrees to provide it, and the destination NS user agrees to its use—it can be used. Indicates the length of the QOS parameters values that apply to the NC being requested. If the NS user cannot determine the value of a QOS parameter, its value should be set to QOS_UNKNOWN. If the NS user does not specify any QOS parameter values, the length of this field should be set to zero. The receipt confirmation selection parameter indicates whether receipt confirmation service is desired by the calling NS user on the NC. The receipt confirmation service must be provided in the network service to be used on the NC. When set, it indicates “use of receipt confirmation”, and when not set it indicates “no use of receipt confirmation”. The expedited data selection parameter indicates whether the expedited data service is desired by the calling NS user on the NC. The expedited data transfer service must be provided by the NS provider for it to be used on the NC. When set, it indicates “use of expedited data”, and when not set it indicates “no use of expedited data”. Indicates the length of the QOS parameters values that are negotiated during NC establishment. If the NS provider does not support or cannot determine the value of a QOS parameter, its value will be set to QOS_UNKNOWN. If the NS provider does not specify any QOS parameter values, the length of this field should be set to zero. The receipt confirmation selection parameter indicates whether the receipt confirmation service is available on the NC and the calling NS user desires its use. The receipt confirmation service must be provided in the network service to be used on the NC. When set, it indicates “use of receipt confirmation”, and when not set, it indicates “no use of receipt confirmation”. The value on the N_CONN_IND is either equal to the value on the request primitive or is “no use of receipt confirmation”. The expedited data selection parameter indicates whether the expedited data transfer service is available on the NC and the calling NS user desires its use. The expedited data transfer service must be provided by the NS provider for it to be used on the NC. When set, it indicates “use of expedited data” or “no use of expedited data”. The value on the N_CONN_IND is either equal to the value on the request primitive or is “no use of expedited data”. If the NS user does not agree to the QOS values, it will reject the NC establishment by invoking a N_DISCON_REQ primitive (the originator parameter in the N_DISCON_REQ primitive will indicate NS user invoked release). If the NS user cannot determine the value of a QOS parameter, its value should be set to QOS_UNKNOWN. If the NS user does not specify any QOS parameter values, the length of this field should be set to zero. The receipt confirmation selection parameter indicates whether the receipt confirmation service can be used on the NC. The receipt confirmation service must be provided in the network service to be used on the NC. When set, it indicates “use of receipt confirmation”, and when not set it indicates “no use of receipt confirmation”. The value on the N_CONN_RES is either equal to the value on the indication primitive or is “no use of receipt confirmation”. The expedited data selection parameter indicates whether the expedited data transfer service can be used on the NC. The expedited data transfer service must be provided by the NS provider for it to be used on the NC. When set, it indicates “use of expedited data”, and when not set, it indicates “no use of expedited data”. The value on the N_CONN_RES is either equal to the value on the indication primitive or is “no use of expedited data”. If the NS provider does not support or cannot determine the selected value of a QOS parameter, its value will be set to QOS_UNKNOWN. If the NS provider does not specify any QOS parameter values, the length of this field should be set to zero. The receipt confirmation selection parameter indicates whether the receipt confirmation service can be used on the NC. The receipt confirmation service must be provided in the network service to be used on the NC. When set, it indicates “use of receipt confirmation”, and when not set it indicates “no use of receipt confirmation”. The value on the N_CONN_CON is equal to the value on the response primitive. The expedited data selection parameter indicates whether the expedited data transfer service can be used on the NC. The expedited data transfer service must be provided by the NS provider for it to be used on the NC. When set, it indicates “use of expedited data”, and when not set, it indicates “no use of expedited data”. The value on the N_CONN_CON is equal to the value on the response primitive. Gives information indicating the cause of the reset. Rules governing the value of the RESET_reason parameter For an N_RESET_REQ, the reason shall always indicate N_USER_RESYNC. The value “undefined” is not permitted when an N_DISCON_IND is issued by an NS user or the NS provider in order to reject an NC establishment attempt. segmentation required where none permitted. Table A-1 shows a mapping of the NPI primitives to the OSI network service definition primitives. This appendix contains tables showing the network-user's view of the possible states that the NPI may enter due to an event, and the possible events that may occur on the interface. The N_INFO_REQ, N_INFO_ACK, N_TOKEN_REQ, and N_TOKEN_ACK primitives are excluded from the state transition table because they can be issued from several states, and secondly, they do not cause a state transition to occur. However, the N_INFO_REQ and the N_TOKEN_REQ primitives may not be issued by the NS user when a local acknowledgement to a previously issued primitive is pending. Table B-2 and Table B-3 describe the variables and outputs used in the state tables. Table B-4 shows outgoing events that are initiated by the network-user entity. These events are either requests to the network provider or responses to an event of the network provider. Table B-5 shows incoming events that are initiated by the network provider. These events are either confirmations of a request, or are indications to the NS user entity that an event has occurred. Table B-6 and Table B-7 describe the possible events the NPI may enter given a current state and event. The contents of each box represent the next state given the current state (column) and the current incoming or outgoing event (row). An empty box represents a state/event combination that is invalid. Along with the next state, each box may include an action. 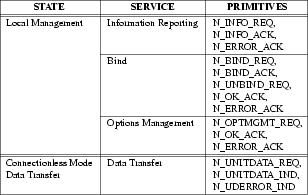 The network provider must take specific actions in the order specified in the state table. Table C-1 and Table C-2 describe the precedence of the NPI primitives for both the stream write and read queues. In both these tables, primitive Y is already on the queue and primitive X is about to be put on the queue. The stream write queue contains network user initiated primitives and the stream read queue contains network provider initiated primitives. The column headings are a shorthand notation for the row headings. This appendix contains a listing of the NPI header file needed by implementations. * Primitives that are initiated by the network user. * Primitives that are initiated by the network provider. #define TOKEN_REQUEST       0x00000002L /* indicates if "token"
* This parameter is specified for both directions. * return a value of QOS_UNKNOWN. A grouping of SDL user data whose boundaries are preserved from one end of the signalling data link connection to the other. The phase in connection and connectionless modes that supports the transfer of data between to signalling data link users. The signalling data link layer protocol that provides the services of the signalling data link interface. The user-level application or user-level or kernel-level protocol that accesses the services of the signalling data link layer. The phase in connection and connectionless modes in which a SDL user initializes a stream and attaches a PPA address to the stream. Primitives in this phase generate local operations only. The point at which a system attaches itself to a physical communications medium. An identifier of a particular physical medium over which communication transpires. ITU-T Recommendation X.213 (1986), [ISO/IEC 8348], Network Service Definition for Open Systems Interconnection (OSI) for CCITT Applications , Blue Book, 1986, (Geneva), ITU, ITU-T Telecommunication Standardization Sector of ITU, (Previously “CCITT Recommendation”). ISO/IEC 8348 : 1987, [ITU-T Recommendation X.213], Information Processing Systems—Data Communications—Network Service Definition , April 15, 1987, (Geneva), ISO/IEC, International Organization for Standardization, International Engineering Consortium. ISO/IEC 8348/AD1 : 1987, [ITU-T Recommendation X.213, Amd. 1], Information Processing Systems—Data Communications—Network Service Definition—Addendum 1: Connectionless Mode Transmission , April 15, 1987, (Geneva), ISO/IEC, International Organization for Standardization, International Engineering Consortium. ISO/IEC 8473 : 1987, [ITU-T Recommendation X.233], [ITU-T Recommendation X.622], [ITU-T Recommendation X.623], Information Processing Systems—Data Communications Protocol for Providing the Connectionless Mode Network Service , SC6 N4542, (Geneva), ISO/IEC, International Organization for Standardization, International Engineering Consortium. ISO/IEC 8208 : 1987, [ITU-T Recommendation X.25], [ITU-T Recommendation X.75], Information Processing Systems—X.25 Packet Level Protocol for Data Terminal Equipment , September 15, 1987, (Geneva), ISO/IEC, International Organization for Standardization, International Engineering Consortium. ISO/IEC 8878 : 1987, [ITU-T Recommendation X.223], Information Processing Systems—Data Communications—Use of X.25 to Provide the OSI Connection-Mode Network Service , September 1, 1987, (Geneva), ISO/IEC, International Organization for Standardization, International Engineering Consortium. System V Interface Definition , Issue 2, Volume 3. ITU-T Recommendation X.210, [ISO/IEC 10731 : 1994], Information Technology—Open Systems Interconnection—Basic reference model: Conventions for the definition of OSI services , Red Book, 1984, (Geneva), ITU, ITU-T Telecommunication Standardization Sector of ITU. (Previously “CCITT Recommendation”). In the future, this primitive will be modified such that it will allow the NPI to accept either sub-network point of attachment addresses or network addresses.